The 1920s and 30s saw an extraordinary increase in the popularity and production of landscape paintings in Ireland. Paul Henry and Jack B. Yeats, who are currently being exhibited side by side in Limerick’s Hunt Museum, were two of the major protagonists of that era. In contrast, European painting at that time was in the throes of Modernism, producing aesthetic innovation after innovation, that was largely self-analytical and retreating into its own flatness. Such concerns seemed secondary for many Irish artists, which would suggest that motivations were being shaped by different factors. These artists did engage in self-reflexive processes, but did so with the aim of exploring identity politics, with landscape painting becoming an important vehicle. The case is usually made that the prevailing subjects and sensibilities in Irish painting emerged as a result of post-independence Ireland’s distrust of Modernism, as well as the conservative social values asserted by the church and state. However, the precedence placed on landscape as a subject can also be perceived as the result of the newly-formed, post-colonial position of Irish artists. In this way, painting the landscape can be understood as an act of repossession, a reclaiming of territory and culture. In both amateur and professional ranks, it is probably safe to assume that landscape painting is the most popular, widely practiced, exhibited and collected form of visual art in Ireland. As a society, we seem to have inherited robust value systems pertaining to the genre. John Shinnors, Mary Lohan, Donald Teskey, Hughie O’Donoughe and many others continue to depict romantic and craggy environs that evoke emotive attachments to place. They remain some of Ireland’s most celebrated artists of the last few decades and this makes sense, because our cultural associations with landscape are a fundamental part of our national identity. This supports the idea that the distinctive conditions (political, social, topographical, etc.) of any place can encourage painterly approaches and methodologies that are particular to it. The influences that the dynamics of an environment have on the production or reception of art are always evident, but tend to be coded in the culture of landscape painting. Likewise, landscape painting can illuminate those very conditions that shape it. Many key Irish painters who engage with the genre today make works and exhibitions that reflect facets of contemporary Irish society and environment. A survey of some of these artists’ activities can illustrate the physical, social and psychological realities of our modern world. To set the scene for this imaginary walkthrough of recent Irish painting which makes reference to landscape themes, I am suggesting that the reader visualises these activities and related materials as being archived together in a single building. I’m proposing the site of a recent project of mine as the location for housing this fictional archive. Last summer I had the privilege of participating in ‘Welcome to the Neighbourhood’– a two-week residency at Askeaton Contemporary Arts in County Limerick. The project I developed during the residency was a departure from my usual format of exhibiting canvases in a gallery context. 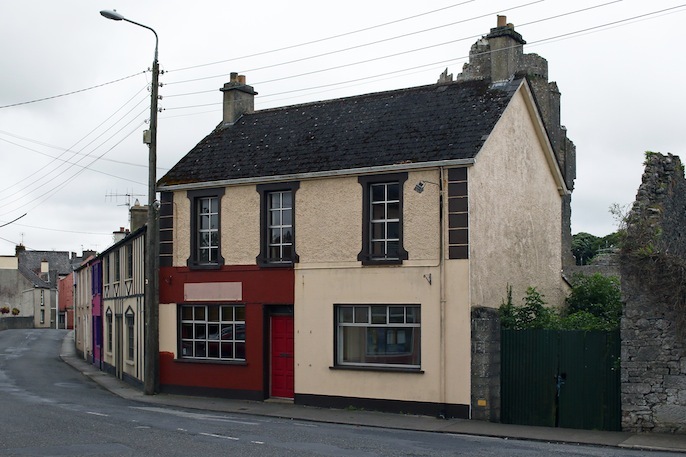 In Askeaton, I intervened with the existing painted fabric of my workspace – a vacant commercial premises in the town – to create some propositional paintings. One of these works was a thin white stripe with embedded black tacks, painted on the edge of the facade along the gable end of the building. This gesture was intended to imitate the edge of a canvas and to recompose or re-imagine the face of the site in the context of a painted object or townscape. While not a requirement of the residency, the intention was to make some sort of re-presentation of Askeaton through the medium of painting, while making visible the existing surface quality of the building and town. Ramon Kassam, ACA Welcome to the neighbourhood project, 2016. The first of four rooms in this setting for an imaginary archive focuses on artworks that reference the built environment. In our towns and cities, almost everything is painted, artificially shaped or has some form of pigment running through it. This is most explicit in our streetscapes, buildings, road signs, street markings, even in the cars we drive, the clothes we wear and so on. The surface qualities of these spaces, and their existing and changing aesthetic and formal languages, can highlight anything from the economic to the social status of a given site. Mairead O’hEocha’s paintings focus on arbitrary but inviting sections of these worlds, depicting civic and residential buildings and ad hoc monuments in the public realm, picking apart the visual elements that form our perception of those spaces. Even when her paintings are not directly referencing the built environment, they are always still construction sites in themselves. She rebuilds in oil and re-imagines her optical deconstructions in versed gesture and lyrical use of colour and substance. In similar territory, Kathy Tynan paints the residue of the built environment through a lively shorthand style. Her depictions of residential areas often feature brooding skies, as if capturing fleeting weather patterns might convey certain atmospheres of urban living. Colin Martin works across a range of media including moving image, and his paintings are imbued with an almost cinematic quality. His exterior landscapes depict undisclosed locations that appear to be socially or politically charged, while his domestic scenes convey the visual language of modern living and interior design. Meanwhile, Eithne Jordan has developed quite a catalogue of painted scenes that survey an extensive range of Irish buildings and streetscapes, so much so that studying her oeuvre would familiarise any visitor to Ireland with the country’s architectural texture, even before their arrival. A series of gouache paintings presented in Jordan’s recent exhibition, ‘When Walking’, at the Butler Gallery (24 June – 30 July) depict the vernacular public and residential architecture of Callan, County Kilkenny, and the surrounding area. Her depictions of domestic buildings channel our associations with such spaces beyond a description of their architectural form and texture. They are painted portraits of individual properties that mirror the visual language of the Irish property website daft.ie. These small, near-tablet-sized paintings echo a new and common form of contemporary online navigation through landscape; one that many of us seeking living space have experienced. In the next imaginary room, we stay in Kilkenny but turn our attention to the natural world. Bernadette Kiely’s paintings record areas around the river Nore in Thomastown to stunning effect. The sum of their material and ocular arrangements mimics natural ecosystems. Her paintings of the recent flooding events around Thomastown and surrounding areas cannot help but call to mind imminent global concerns around climate change. They trigger associations with the increasingly familiar RTÉ news footage from around the country documenting areas that are being severely affected by changing weather patterns. If there is a frustrating aspect to encountering natural beauty in the landscape, it might be in our limited capacity to process it. Standing before it, we desperately try to soak everything up and commit it to memory. We take photos to store memories of these spaces and to share online. The technology available never quite seems to fully record these experiences, but through the perpetually-increasing capacities of virtual reality, it is getting better. In the early 2000s, Irish-based Austrian artist Gottfried Helnwein made a series of large, hyper-realistic, panoramic-format paintings, which reflect his desire to retain his experiences of scenery around Tipperary and Waterford. The images he created might be some of the most intricately-detailed painted recordings ever made of the Irish countryside. Now in the third room of our overview, we recognise that of course not all landscape paintings reference real-world places. There is a large contingent of contemporary Irish painters making images of ambiguous, unfamiliar and strange worlds. In this loose subset of landscape painting, artists get to more freely set the terms of the natural and narrative laws of the universes they create. For example, Micheal Beirne’s detailed paintings are intricately entangled. All the elements in his paintings, the terrain and its inhabitants, are familiar to us, but only in isolation. Coming together, they depict wild and bizarre scenes. Similarly, Gillian Lawler’s images feel even less familiar; the space between us and them feels vast, either in time, distance or both. These sci-fi-like paintings of chequered architecture and topography present the conditions and contextual settings for some unfolding drama or melancholy. In a similar vein, Sean Guinan’s work retreats even further from the recognisable. It is hard to establish at times whether they are even spaces at all. The laws of physics in the worlds he creates can change from painting to painting. With a great flair for form and colour, Guinan creates dense, impenetrable impasto terrains, or at other times, crisp minimal vistas and territories full of vitality and confusion in equal measure. In spite of many of these artists moving away from the physical appearance of our world, their landscapes often seem to more acutely portray its psychological realities. The final room in our imaginary archive highlights the ways in which Irish artists are addressing the tense and polarising political conditions of our times through landscape painting. Joy Gerrard’s paintings of protests from her 2016 exhibition ‘Shot Crowd’ at the RHA, feel stark and uncomfortably familiar. Huge monochromatic crowds move through cityscapes and seem just about ordered, but project the same threat of unpredictability and breakdown as the flowing ink used to depict them. In these works, technique, form and content converge to form hyper-mediated images that feel as if they exist on a knife-edge and are about to erupt. Closer to home, the recent mobilisation of political resistance in Irish society has found its voice in mural paintings. Though not always considered part of the painting canon, murals, specifically those associated with the Troubles in Northern Ireland, are perhaps the most internationally-famous examples of Irish painting alongside our illuminated manuscripts. A work that activated discussion on the politics of public space was Irish street artist Maser’s ‘Repeal the 8th’ mural, painted on the wall of Project Arts Centre. The mural was ordered to be removed soon after its completion by Dublin City Council on the grounds of apparent planning violation. When news of what seemed like political censorship of the mural broke, its distribution as an image accelerated online. As a result, it has become one of the defining images of the movement. As a painting subject, landscape still very much has precedence within contemporary visual art in Ireland. The painters discussed in this text represent just a fraction of those making significant contributions to this ongoing discourse and ever-expanding archive . Collectively, these artistic inquiries offer insights into our current moment, through engagements with pivotal spaces and timely events, in Ireland and beyond.